A photography contract template can help you clearly organize the terms for the photographer you hired to capture photos of your event. The photography contract template is also useful if you are a photographer and will be contracting with a client for your services. The photography contract should state the time and duration for which the photographer will capture photos. It should also include how much the photographer will be paid and the location where the event is taking place. Get started Create Your Photography Contract Answer a few questions. We'll take care of the rest. 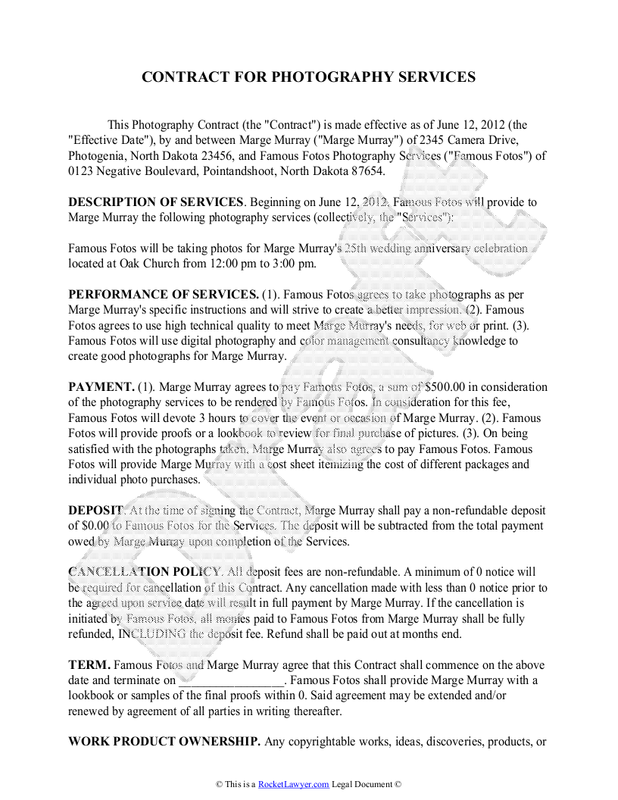 In the sample photography contract template below, Famous Fotos has contracted with Marge Murray to shoot photos of her 25th wedding anniversary. Sample Photography Contract. To create your own personalized photography contract, click on the image above. Whether you're a wedding photographer, a portrait photographer, or just an enthusiastic amateur, most photography contracts look similar to this sample photography contract template. It's important that both the photographer and the client agree to the terms of the contract. Want to get started? Simply click on the link below to start your personalized photography contract. Rocket Lawyer also has more useful information about running your own business in Get Free Legal Help with Business Formation and Starting a Business, How to Buy or Rent Office Space for Your Business, and How to Apply for an Employer Identification Number (EIN - SS4) Online. When Do You Need a Model Release Form?